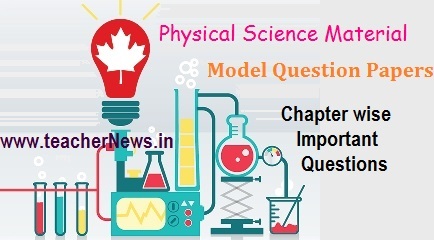 AP SSC / Telangana Physics Public Exam Model Papers and 10th Class Physical Science Important questions and CCE model Study Material in Telugu and English Medium. AP / Telangana SSC Physical Science Material has been prepared by G. Sreekar. SSC Public Examination Physical Science Telugu Medium and English Medium Material chapter wise for students. Physical Science Public exam 1 mark questions, 2 marks questions, 4 marks questions and 5 marks Diagrams Download. Physics Chapter wise Important questions, Model Papers and Material of Heat, Chemical Reactions and Equations, Reflection of light by different surfaces, Acids, Bases and Salts, Refraction of Light at Plane Surfaces, Refraction of Light at Curved Surfaces, Human Eye and Colourful world, Structure of Atom, Classification of Elements- The Periodic Table, Chemical Bonding, Electric Current, Electromagnetism, Principles of Metallurgy and Carbon and its Compounds. Good post thanks for sharing information about SSC Physics study materials. that will help students who are studying 10 th class to gain in absence of teachers. this material has been very helpful to prepare my tuition students. thank you.